Cinco De Mayo is upon us bringing with it a fantastic weekend of boxing as four undefeated fighters take to the ring to defend their records or the right to keep their championship belts. There are some interesting storylines, here’s what to watch. This is not the big drama show a Canelo rematch would have brought, but the Golovkin v. Martirosyan is still a challenging fight for the undefeated champion, Gennady Golovkin (36-0-1, 33KO); all his belts are on the line as he goes up against two-time world title challenger Vanes Martirosyan (36-3-1, 23KO). Though Martirosyan is going up a weight class to fight Golovkin, promoter Tom Loeffler has called the matchup “a dangerous fight” while Golovkin humbly suggested “one punch can change everything.” At Wednesday’s press conference, Don King, Martirosyan’s promoter, struck a foreboding tone, predicting that the stars above the StubHub Center will be aligned for the champion’s first loss. 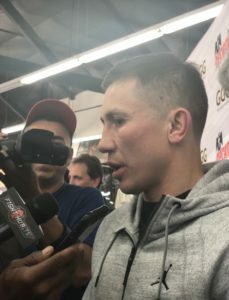 He addressed his remarks to Golovkin, “The inimitable words of Mohammed Ali says, you have to lose to be a whole champion, there’s no disgrace in losing.” And of his fighter, Martiroysan, King said, “This may be the opportunity that Vanes is waiting on because yesterday’s nobody, becomes tomorrow’s somebody.” Pre-fight hype? Not for Golovkin, “I understand my situation, this is not an easy fight, this is a huge fight for us. I promise, we bring amazing show, amazing event.” This fight is without doubt not one to miss. If there is an active fighter with more titles and accolades than Golovkin, it is Cecilia Braekhus (32-0, 9 KO and 22-0 in championship matches.) The Columbian-born boxer who fights out of Norway, is embarking on the 22nd defense of her titles IBF-WBA-WBC-WBO. She has heen the welterweight world champion for the past nine years. And yet, this fight, set as a co-feature to the GGG-Martirosyan, and having the distinction of being the first live broadcast of a woman’s bout on HBO, is not necessarily a walk in the park for Braekhus. Her opponent, former world WBC middleweight champion, 27-year-old Kali Reis (13-6-1, 4 KO) will still have a size and youth advantage as she goes down two weight classes to fight the 36-year-old Braekhus. 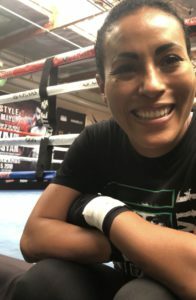 Says Braekhus, who continues to hone her skills as she matures, “I am definitely another fighter today than I was ten years ago, and I always have to adapt to that, I always have to adapt to stay sharp.” She added, “I feel the young girls, you know, they are breathing down my neck, I always need to be sharp.” Boxing legend Lucia Rijker, who has been training Braekhus for this fight will be in her corner Saturday night. The moment in history is not lost in Rijker, who said to boxinginsider.com at a recent interview, “ I know my place as a coach, this is the time for the new generation and I’m honored to be a part of it with a humble heart.” All the women will have the platform at StubHub, under the stars to show the world, women’s boxing belongs on primetime along with men’s. Challenger Kali Reis, understands the the opportunity and the significance of this bout, “It’s not just live boxing on HBO, its the co-main event, that is huge. Not only for myself, not only for Cecilia, but for women’s boxing as a whole…We’re in it to fight and we can fight.” Tune into this one, it will likely be the best fight of the night. 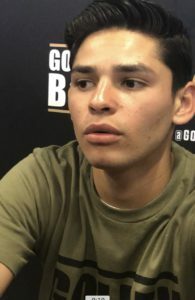 Boxers On the Rise: Ryan Garcia and George Kambosos Jr.
It’s likely ESPN’s 2017 Prospect of the Year, 19-year-old Ryan Garcia (14-0, 13 KO), from Victorville, CA, with meticulous grooming of his boxing career by Golden Boy Promotions and supported by Garcia’s fast growing 800k Instagram followers, needs little more highlighting. On May 4th, the junior lightweight may actually have a worthy contest in the seasoned 30-year-old Puerto Rican fighter, Jayson Velez, (26-4-1, 18 KO). 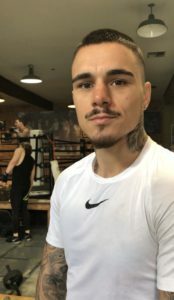 Garcia will want to feed his ambition of fighting Gervonta Davis and being the youngest pay-per-view star, as well as his growing fan base, with another decisive win. With such heightened media exposure at such an early time in his professional career, it seems Garcia is defending his fame rather than ascending to it. Nonetheless, fans shouldn’t miss out on watching this fighter’s impressive ability to “see and catch” his opponent’s next moves and launch a powerful and fast knockout punch. He described his technique to boxinginsider.com, “I see where he (the opponent) goes, and once he makes a little tiny mistake, my punch is there and I deliver my full ability” Coming off the lightning fast first round knockout of Fernando Vargas, just six weeks ago, boxing fans get another chance to see KingRy impress. May 4th, 7:30PM PT on ESPN2 and ESPN Desportes.